Step up Idiot Nation! Green Day’s American Idiot has set off on tour around the UK in a blaze of fire, noise and utter mayhem. 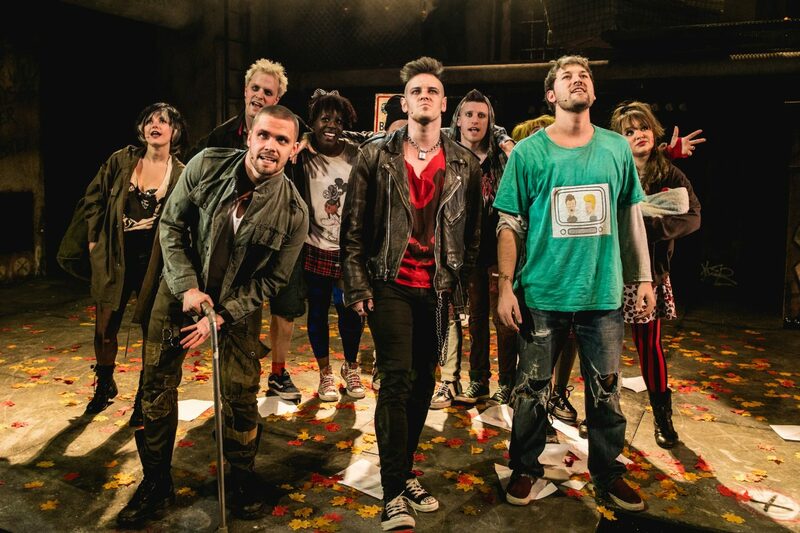 Having missed this in the West End I was excited to finally experience the modern day rock opera and I wasn’t disappointed; busy, chaotic and totally in your face but it’s an absolute masterclass in modern musical theatre. 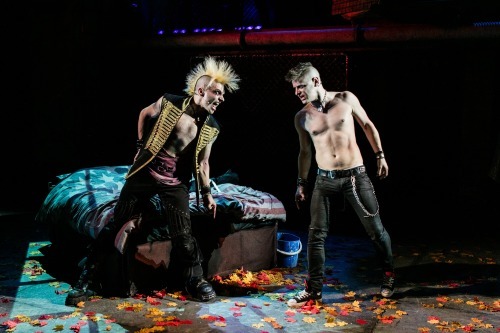 American Idiot follows three friends searching for meaning in a world rocked by the tragic events of 9/11. After going their separate ways they experience love, loss and internal unrest as drugs, war and relationships impact their young lives. I was immediately blown away by the music in this show – it’s by far its strongest asset. Green Day’s songs lend themselves so well to musical theatre with sublime harmonies and emotive power. It’s hard to pick out a highlight with such a strong soundtrack but Boulevard of Broken Dreams just worked, both musically and on the stage. 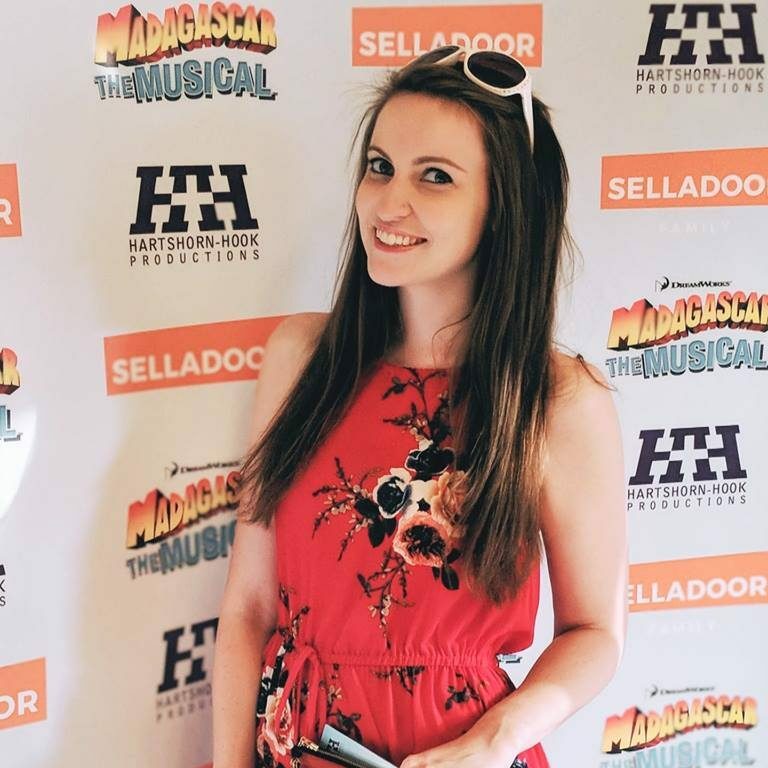 Unfortunately it seems Amelia Lily is suffering from an illness, and with Alexis Gerred as well missing the cast was completely shifted with Alice Stokoe taking over as Whatshername and Cellen Chugg Jones stepping into the role of Tunny. You have to give credit to a cast that can pull together a show like that with two leads missing. I struggled to believe Cellen was an understudy – his performance was superb with a stunning voice and convincing characterisation. Matt Thorpe was incredibly strong, holding the show together and confidently handling some difficult scenes. Equally impressive, his drug-addled alter ego, St Jimmy, was elegantly illustrated by a bold Lucas Rush. Together they effortlessly portray the complex struggle of a drug problem and really model the themes of the musical giving the show substance. The show is technically challenging with an impressive lighting setup and the clever use of television clips and pre-records. There was only one slight hitch with the timing of the screens in Favourite Son which was slightly distracting but hardly ruined the performance as a whole. It’s a busy show and not for the faint-hearted but neither should it be reserved for fans of the band. It is in no way a run-of-the-mill jukebox musical – it doesn’t have the most complex plot but some powerful motifs sustain the show and compel you to invest emotionally. You can appreciate it in so many ways – it’s bold, rebellious, doubtless and totally on the money. Green Day’s American Idiot runs at the Churchill Theatre Bromley until Saturday 2nd April and tours the UK throughout 2016. Tickets available online.